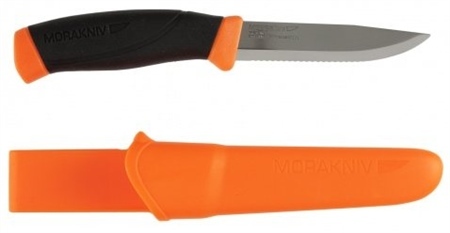 Knife with a patterned high-friction grip and serrated blade that has been developed for cutting rope, nylon and fiber. Blade of Swedish cold-rolled special stainless steel. Plastic fluorescent sheath with a belt clip. Blade length 100 mm. In accordance with UK law, you must be over the age of 18 to purchase knives. Necessary checks will be carried out on all purchases of knives.